Hat tip to Paul for the pointer. 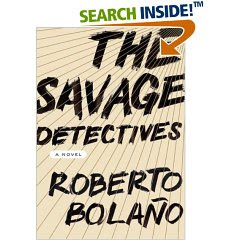 The Savage Detectives is a novel by the Chilean writer Roberto Bolaño. Bolaño's style is reminiscent of García Marquez and even I. Allende. However, the voice of the author comes across quite uniquely. Bolaño seems to manage to navigate with relative ease from character to character. And what marks him, in my view, is the ability he has to clothe each and every character ever so individually and memorably. To those of you interested in Latin America and Latin American literature, The Savage Detectives will be a most helpful addition to the library. While the many Dionysian trips that Bolaño describes could perhaps give one a sensory overload at times, for some reason they seem to be comfortably housed in a rather conventional domicile. The narrative seems to develop organically and naturally. So, why read this book? It is one of those literary experiences that a reader simply needs to have: it's a happy marriage of the Apollonian and the Dionysian. Also, I find Bolaño's gendered expressions most interesting and worthy a read. I recommend. Did you read Bolaño in Spanish or translation? If it's the latter, which translation is it? If it's the cover on the blog, than it's got to be the Wimmer..., right? Does the book attempt a fusion of fiction/nonfiction? I think I'm ready to read the new magic realism-y work. Allende's Daughter of Fortune was the last one and I'm ready to go elsewhere now. I'd read it if it promises to leave the magic realism realm.... Does it? he covers more geographic territory in latin amarica, that's for sure. great read, yes. and just right for a weekend, i found..... thx.